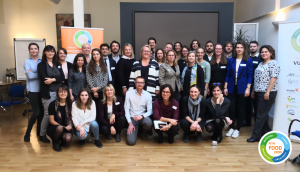 The FIT4FOOD2030 consortium held their annual conference on 22-23 October 2018. We are one year into the project – so what has happened and where are we at with building the FOOD 2030 Platform, our tool for a systemic change of the food system. The consortium during their first annual meeting. Our EU Think Tank is set up and running since last June providing a link to the European Commission and serving as a sounding board with global outreach. 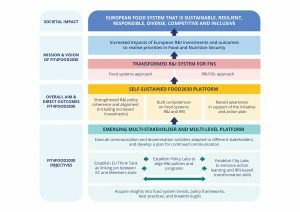 On all levels our FOOD 2030 Platform structures have already provided more than we expected from them with City Labs engaging more people than anticipated at this stage, the Policy Labs finding such high resonance that we have two more than initially foreseen for this stage of the project, and the EU Think Tank pro-actively providing us with a policy brief. The FIT4FOOD2030 partners have been working to train City and Policy Lab coordinators to increase their knowledge and boost their skills for successful stakeholder engagement, facilitating visioning processes, identifying competences within the system and food system understanding. Tools, scripts and instruments have been drafted to initiate transformative processes at all of the FOOD 2030 Platform levels. The FIT4FOOD2030 partners are also working to understand the drivers as well as challenges and barriers for the transformation of the food system. Hence, the FIT4FOOD2030 partners have collated a list of trends which will impact the food system one way or the other as a basis for a common understanding of visions, trends and drivers in the food system for the lab activities. Further, the partners are collecting potential showcases within the food system (in context of research and innovation) and are analysing potential breakthroughs that may be ahead of us. Insights into trends, showcases and potential breakthroughs within the food system support the City and Policy Lab work by providing essential information to be considered for their roadmaps. The collection of this information is the result of a joint effort with a variety of stakeholders from academia, industry, policy makers, NGO’s, and other organisations, many of them interacting at the local and national level via the City and Policy Labs. For more information on how the FIT4FOOD2030 approach works view this video of coordinator Prof. Jacqueline Broerse talking about why problems in the food system are persistent (despite a lot of money having been put into solving them) and how a system transformation as envisioned by FIT4FOOD2030 is needed to solve these problems. Roadmaps towards an aligned research and innovation system within Europe will be considered. Want to stay up to date or be notified once the key note speeches from the annual conference are publicly available? Sign up to our newsletter to be notified straight away!